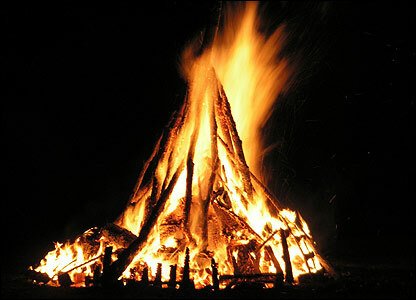 June 23rd, is St. John’s Eve, or as it is known in many parts of Ireland, Bonfire Night. It was traditionally marked by the construction of large fires throughout the countryside. These were lit at sundown and were the focal point of communal festivities. People gathered to dance and sing, while young men proved their bravery by leaping through the flames. The night was also rich in folklore, much of it concerned with fertility. Prayers and rhymes were recited to ensure a plentiful harvest. Indeed, the fire itself was thought to have magical powers. Burning weeds in its flames would prevent arable fields from becoming overgrown, while scattering its ashes would guarantee the land’s fertility. Similarly parading through the fields with lighted branches from the bonfire would protect the crops from disease and pestilence. It was also deemed particularly lucky to bring the ashes home to light the kitchen hearth. Although most of these customs are no longer practised, lighting St. John’s bonfires still takes places in many parts of Ireland (especially the west). It is hardly a coincidence that these fires are lit so close to the Summer Solstice and it suggests that the custom may have ancient roots. In 1965 i stayed with a farm family in Ballynafad(?) Connemara. On St John Eve the whole family traipsed up a nearby hill to light a bonfire. We sat around singing talking “give us a song now..” kids jumping around. Sometime us 3 girls ended up sleeping on the sofa. “Did ya see the light in the graveyard now?” Yes. We had lit a candle to look at the gravestones. An and one of our crazy friends from Trinity College wore a tiger skin from the cottage he rented. Another played dirges on a squeezebox he found. I carried a giant leaf growing at the side of the road. Sun stays up late in the West on Midsummer. We were all very merry. I saw bonfires all over the hills on St Johns Eve in Connemara. Under the 12 Bens. June 23, 1966…. Really.